Note: You may want to check out our tips at the bottom of the page before starting. First gather your materials, and lay down a Trimaco SuperTuff Dropcloth to contain mess, and provide an easy clean up! To create the ghost body, we will first need to make a mold. To do this, simply take your cardboard tube and cut 1.5-inch tall slits in the bottom. Sprawl the sections out, and tape down with Trimaco’s Painting Tape. This will secure the mold while we drape the wet cheesecloth to create the body. Cut a small hole on both sides of the cardboard cylinder. Cut roughly 2 feet of the 22-gauge floral wire. Fold in half for extra support. Thread the wire through the holes. These will act as the ghost’s “arms” while we drape the cheesecloth, so bend however you please. 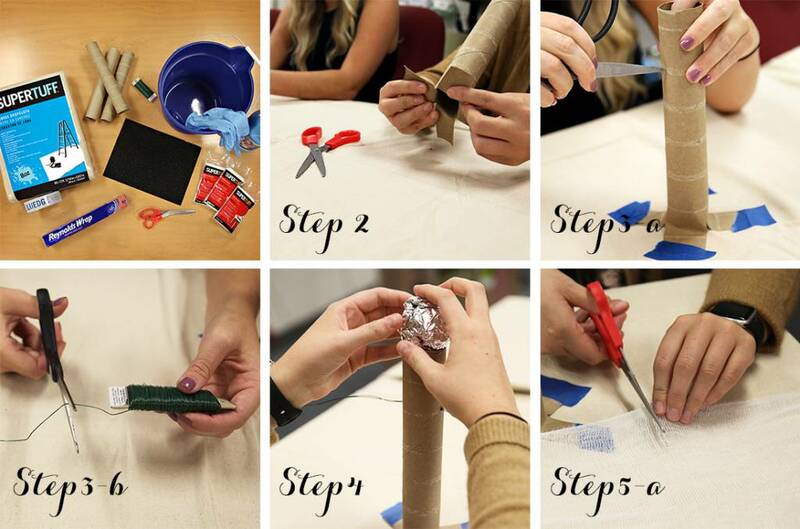 Crumble the aluminum foil into a proportional sized ball and tape on top of the secured cardboard cylinder mold. This will provide a round top, creating the ghost’s head. Cut the Trimaco SuperTuff Cheesecloth into strands, long enough to drape on both sides of the mold (for paper-towel sized-molds this is roughly 2 feet). Pour the Liquid Starch into a Trimaco bucket and dip the cut Cheesecloth pieces into the Liquid Starch. Let excess Liquid Starch drip. Simply drape over the mold in all directions until completely covered. If mold begins to fall, use supports to hold the base in place. Let the cheesecloth dry overnight. Once dry, remove the ghost off the mold. Create eyes and/or mouth for your ghost’s face with the black felt. 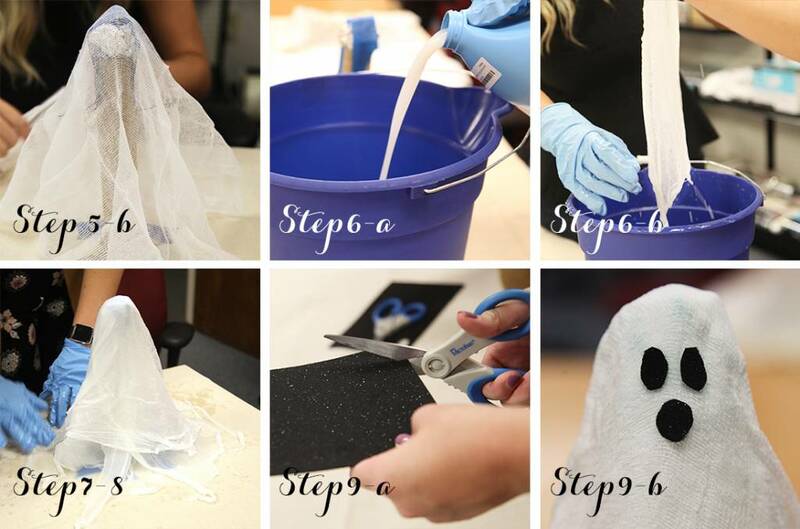 When dry, glue the pieces to create your ghost’s face. Display your ghost, give him a name, and repeat to make him/her some friends! We recommend using a white paper tape (such as Trimaco’s KleenEdge Low Tack Painting Tape), to avoid bleeding and discoloring the bottom of your ghost. Cardboard cylinders, did just fine. But if we were to do this again, we would choose a sturdier mold – such as a water bottle or wine bottle. We recommend using the Eliminator Butyl Dropcloth. It will not only give you leak proof protection, but we learned that the liquid starch absorbed the tan coloring of the SuperTuff 10 oz Heavyweight dropcloth. Make sure you really let the liquid starch drip before placing the soaked cheesecloth onto the mold. Trust us – the assembly, dry time and cleanup will be much faster. 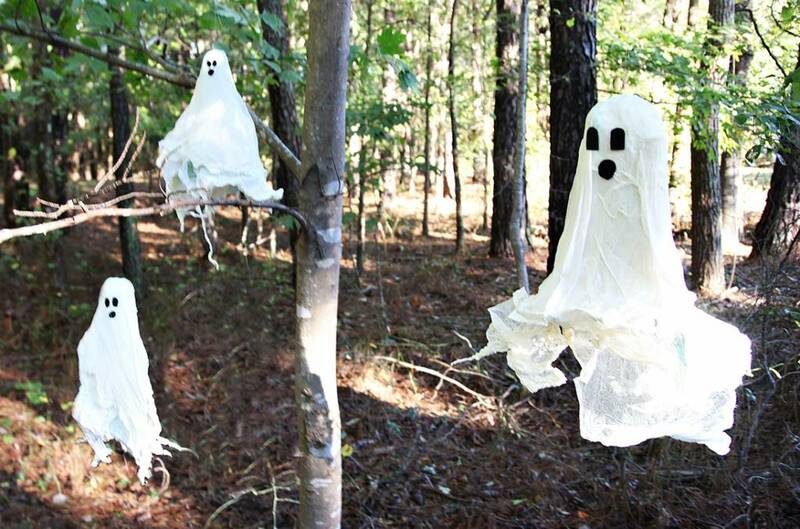 Leave your ghost standing or add a hole in the top of the head, thread a piece of clear thread (roughly 3-4 feet), and fly your ghost from a tree limb!